Here you have a 3rd and long situation near the goalline, a situation that almost demands Cal passes the ball–Hawkins and Jackson lined to the left, Jordan down to the right, Stevens at tight end and Forsett in the backfield. You have the most talented wide receiver corps in the country and a quarterback with a chip on his shoulder. You MUST PASS THIS BALL. Right? Now, I’ve watched plenty of the Bears to know the strengths and weaknesses of each of Cal’s players is. Forsett’s weakness–running into a crowd. Forsett’s strength–running into open field. Give him open field and you’re asking for trouble. 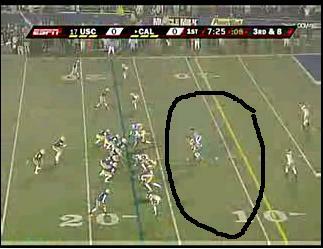 And you can already see USC is way out of alignment. Eight men at the line of scrimmage, two safeties standing in the end zone, a lone linebacker occupying a space the size of the Vatican. Well, you can probably see the issue developing in front of your eyes. 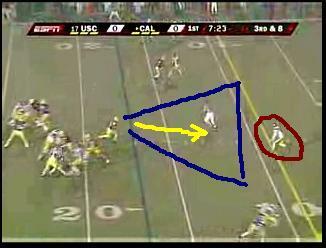 USC is going to try to rush five (probably the linebacker too), force an errant throw to the corners or a short dinker not at the first down line. 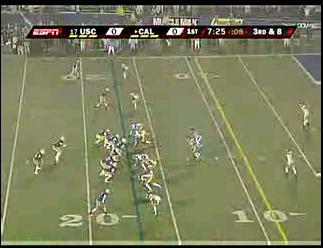 Thankfully, on this play, Tedford has other ideas about where he wants the ball to go. The linebacker bites, and you can see the hole developing in the middle. Whoops. If you’re a Cal fan, you can see what’s coming. Delayed handoff draw to Forsett! Cal’s offensive line has the hole opened up wide and the front seven are out of the picture, and now Justin has plenty of options and space to go left or right. However he still has a safety up in front of him, so he has to decide whether to challenge him up front or split for the edges. Oh come on. Justin’s a man. He’s going straight up and daring the safety to bring him down. Let him try. Plus we can see another Trojan coming from up top and two more defenders on receivers realizing it’s not a passing play, so time to cut right. 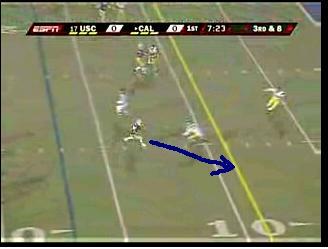 USC Safety=Fail. 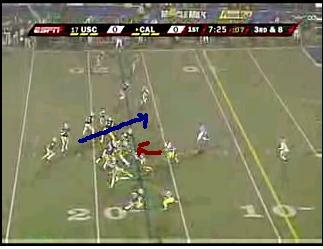 Now one more USC defender, but Forsett has the momentum and the advantage. Juke a little and he’s out of here. Whoops. Bye-bye. Add in nice blocking by Jordan and Forsett has the corner. 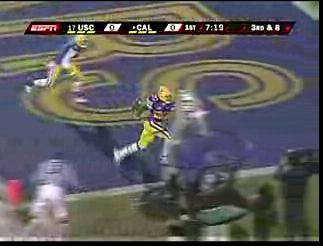 Touchdown, 7-0 Cal! 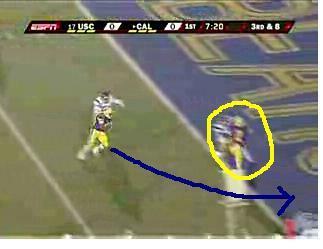 And for a brief moment, Cal fans think they can win this game. 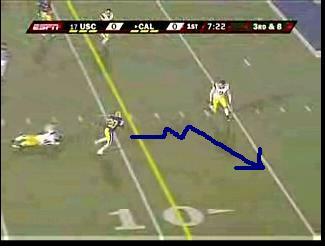 Unfortunately, Cal could not come up with much after that once USC realized Nate couldn’t really throw the ball. But hey, upside is upside. And hopefully Cignetti can incorporate this art of misdirection into his powerhouse WAC-crazy offensive style. Any thoughts on this playcall? Any other plays from this season that you’d like to see me break down? Let me know in the comments.